At River of Dreams, we pride ourselves in offering quality food products for you. We offer grass-fed beef and lamb, as well as free-range chickens and eggs. Our products are all free of additives and our animals are norganically raised using sustainable methods that ensure a high-end product for the discerning consumer. We invite you to take a look around, and explore what we have to offer! In 2002 River of Dreams, Inc. moved off the drawing table and into the meeting room. We began our journey onward wiith our commercial dairy herd until 2006 when we needed to switch gears. The dairy herd left, and the first 6 Herefords arrived on our yard. We pasture our grass-fed beef and lamb using a MIG (management-intensive grazing) system. Our MIG system is both sustainable and organic, which is the first step to making our grass-fed beef and lamb delicacies on any table. Our processors do a great job finishing the process so we can deliver healthy delicious entrees for you. Pandora, our female Great Pyrenees, was born on January 12, 2011, and arrived with our first Katahdin sheep. Zeus, our male Pyr, was born March 17, 2012, and has been under Pandora's tutelage since arriving on our farm this past May. Pandora and Zeus make a great team guarding the sheep and are practically inseparable with Pandora patrolling her territory while Zeus observes and learns. To keep our customers informed about what is new at River of Dreams, we publish a newsletter at least twice a year, in spring and fall, more frequently if we have something to share. Feel free to read our newlettters to learn more about us and don't hesitate to give us your fedback! If you have any questions or comments, feel free to contact us! Hopefully, you believe the effort we put into raising healthy food is worth it to you. We appreciate you visiting our website and welcome your feedback. Our website changes like the seasons on a farm so please visit us again soon. 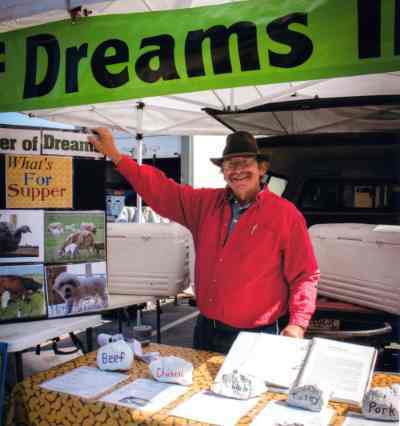 At River of Dreams we raise 100% grass-fed beef and lamb on our farm. We sell both of our grass-fed beef and lamb by the cut all year round, and grass-fed beef by the spit-half (1/4), half, or whole and grass-fed lamb whole in the late fall. We also offer GMO free, organically raised free-range chickens and egg as well as our premium pork. Wholesome food has never tasted better than this! All our products are high in Omega 3 fatty acid (the good fatty acid), and of course CLA's.